Yesterday, I reported in this blog what price appreciation has been in the Burlington and South Burlington VT real estate markets. The National Median sales price for an existing single family home are down 6.07% from a year ago from across the USA. This statistic when juxtaposed against yesterday’s local real estate numbers reported in my blog highlight the staying power and strength of our local real estate market. 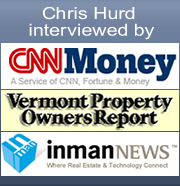 If you would like to add a comment, please do so by posting a comment here at Hurd’s The Word or go to my website at Burlington Vermont Real Estate.